South Asia – Bangladesh, India, Nepal, Pakistan, and Sri Lanka – is home to about 25% of the world’s population. Perhaps somewhat overshadowed by its larger neighbours, Bangladesh nevertheless has a population of around 160 million all by itself, almost half of which (48%) is under the age of 24. With that burgeoning college-aged population, it is no surprise that tertiary enrolment in the country has also been booming. More than three million Bangladeshis are now enrolled in higher education, and the country’s University Grants Commission projects that that total will climb to 4.6 million by 2026. Even so, tertiary participation rates have lagged behind regional leaders, such as India and China, and the domestic system has struggled to keep pace with demand, in terms of the number of available spaces, the quality of education, and employment outcomes for graduates. As we noted in an earlier report, private providers have come to play an increasingly important role in expanding domestic access to higher education. New legislation, first brought forward in May 2014, has also opened the door to foreign universities setting up joint ventures in Bangladesh with local partners. Nearly three years on, however, there has been little progress in this respect and recent reports indicate that Bangladesh’s Education Ministry has moved to block University Grant Commission-backed branch campus applications from British and Australian universities. As domestic capacity continues to lag behind demand, growing numbers of Bangladeshi students are pursuing post-secondary education abroad. The latest data from UNESCO indicates that nearly 31,000 Bangladeshis were enrolled abroad in 2015, a 33% increase over the two years from 2013. 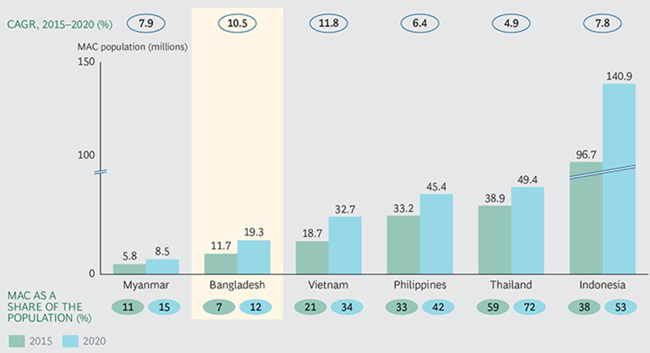 The leading destination, Malaysia, received about 20% of those students in 2015, with other major receiving countries, including the US, the UK, Australia, and Germany rounding out the top five destinations for Bangladeshi students. A recent report from the Boston Consulting Group (BCG) describes Bangladesh as “the surging consumer market nobody saw coming.” On the strength of steady economic growth, stable inflation, low public debt levels, and growing remittance inflows, the population of “middle and affluent consumers” (or MACs) has grown to about 12 million people, or about 7% of the population. The other notable characteristic of Bangladesh’s middle class is just how concentrated it is geographically. While this will change over the next decade, as reflected in the illustrations below, Bangladeshi MACs are heavily concentrated in two urban areas today. The BCG report concludes that, “Very few global companies saw this market coming, so market leadership is very much up for grabs.” It cautions that the market is very value-conscious and that any marketing effort should stress both quality and value-for-money, or ROI. It notes as well that mobile technologies are being widely and rapidly adopted by Bangladeshi consumers and that digital marketing programmes must be well-optimised for mobile. This entry was posted in Asia, Bangladesh, Higher Education, Regions and tagged Bangladeshi students, education abroad, higher education statistics, universities with international students, branch campuses.